Manuka Health MGO 400+ is 100% pure Manuka Honey straight from the breathtaking landscapes of New Zealand. Honey is well known to have a wide range of health benefits and Manuka Honey is particularly prized for its potency and purity. Manuka honey is the only 100% natural food in the world shown to have EFFECTIVE and RELIABLE anti-bacterial activity due to the active compound “Dietary Methylglyoxal”, which forms naturally in the Manuka plant. Manuka Health measures methylglyoxal content based on standards developed by University of Dresden. The higher the MGO™ Manuka honey rating, the higher the level of anti-bacterial activity in the honey. 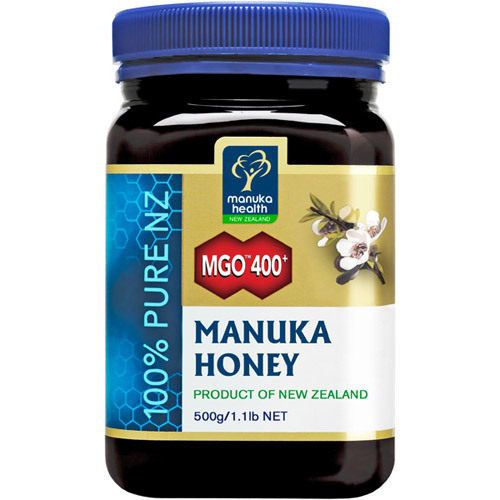 MGO™ Manuka honey is suitable for everyday use and can be used as a long-term maintenance dose. It can be taken through eating or through application to the skin surface. You will find it has a wonderful taste all of its own and can be enjoyed the same as any other natural honey. Manuka Health measures methylglyoxal content based on standards developed by University of Dresden (Germany), who discovered this active compound in Manuka honey. For example, MGO™ 100 Manuka Honey has been tested and is certified to contain at least 100mg/kg of dietary methylglyoxal – the minimum required for health benefits. Take 1 teaspoon (5g) 30 minutes before meals, 3 times daily. Intake can be increased if necessary. Below are reviews of MGO 400+ Manuka Honey - 500g by bodykind customers. If you have tried this product we'd love to hear what you think so please leave a review. Bought this for my brother and he is really pleased with the improvements he’s had since using it. Less bloating and a stronger immune system. Definitely recommending! Bought this honey for my daughter who is suffering from Lyme disease, she has noticed an improvement in her condition. Although expensive it’s well worth the cost if it helps with her recovery. This honey maybe expensive, but it is worth every penny. I use it in the morning with organic cider vinegar and a little water, helps to lose weight, and change the stomachs acidity to alkaline.